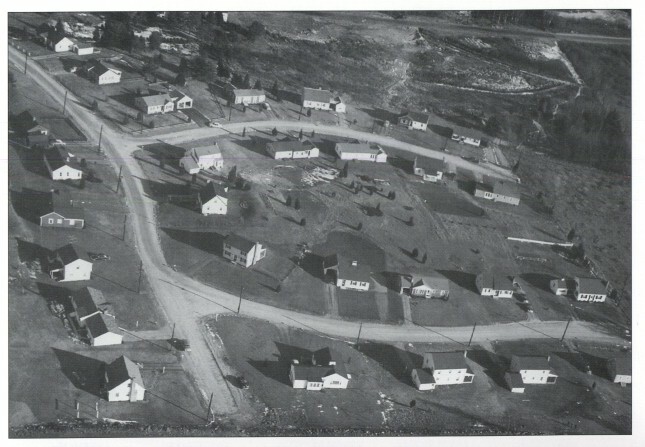 Throughout the 1950's, Wayland was a town similar to many others in the area. While the 1950's were generally conservative times, they were not static in all respects, as the town experienced ten years of record growth and development during the decade. As the 1940's drew to a close, the stage was set for a boom in demographic and economic growth. The return of World War II Veterans in 1945 fueled a vast population explosion known as the "Baby Boom." Today, the advent of the Baby Boomer generation is regarded as one of the most quintessential 1950's themes. 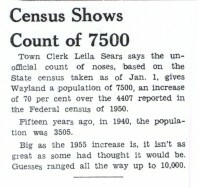 In Wayland the population more than doubled within these ten years. As Wayland developed throughout the 1940's, the town could not possibly imagine the change that would come about in the next few years. The incredible population growth from 4,400 people in 1950 to 10,200 people in 1960, meant that a tremendous expansion of houses and schools would have to occur. The Boomers would later break traditions in many ways--they were labeled, for example, as the rock and roll generation and the 'now' generation. New cultural trends began to take over, such as rock and roll, which challenged the once dominating themes of conformity and and conservatism. Due to the increasing birth and growth rates, there was the expansion of new houses and skyrocketing school enrollment numbers. 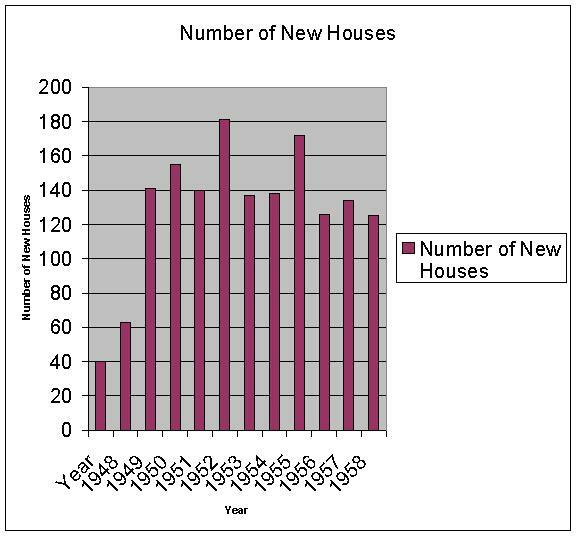 For example, in contrast with the 40 new homes built in 1948, 181 were constructed in 1953. The number of students enrolled in grades 1-12 more than doubled from 1950 and a total of 947 students to 1959 with a total of 2,193. 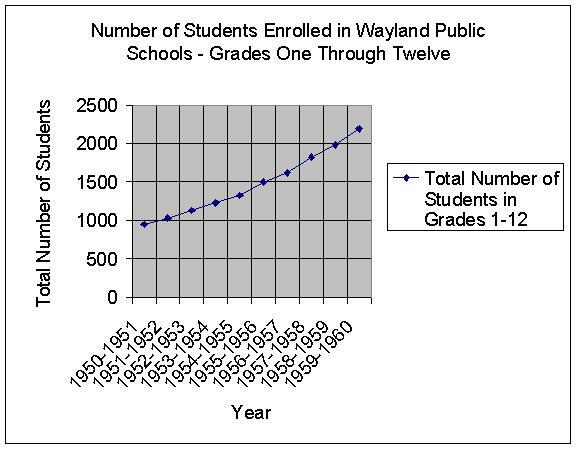 This increase in the number of students led to more then just bigger class sizes, as the citizens were forced to construct three new Wayland schools beginning in 1955. These schools would remain intact for years to come, a constant reminder of the old generation and the fertile times of the 1950's! Wayland's character as a suburb of Boston located along the new 128 beltway meant that the number of every-day commuters increased steadily. While large numbers of residents found stable and well-paying jobs at the new Raytheon plant, every morning approximately 2,000 Wayland commuters would set off for 72 nearby towns and cities (League of Women Voters survey and report, 1960). This was yet another representation of Wayland's small town personality as an emerging "bedroom community." Even though these 2,000 workers had to leave the town to work elsewhere, Wayland was attractive because of its "small town" educational system and its overall flavor as a great place to raise a family in the 1950's. 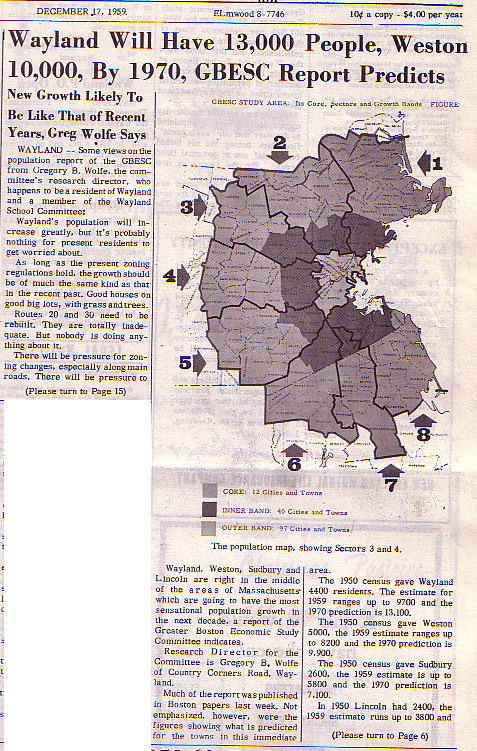 Wayland was and continues to be a town overwhelmingly influenced by the baby boom generation. In every way it appears that our small northern town is highly representative of the national demographic trends of the era. Please click on the images below to view an enlarged version.